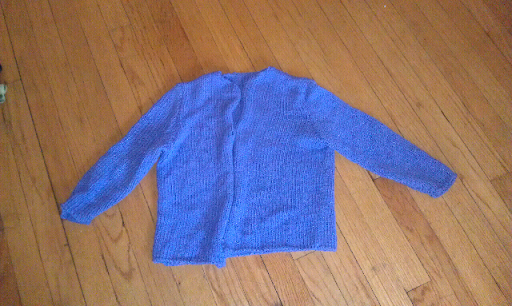 When I was at my parents' house over Thanksgiving, I went though my boxes until I found the first sweater I ever knit. 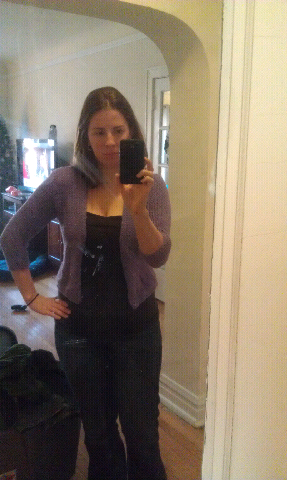 I made this cardigan my senior year in high school, with help from my adviser, Laurie. Laurie got me back into knitting, and helped me have the confidence I have today. She took me to the yarn store to select the fiber, and even knit one of these sweaters along side me! 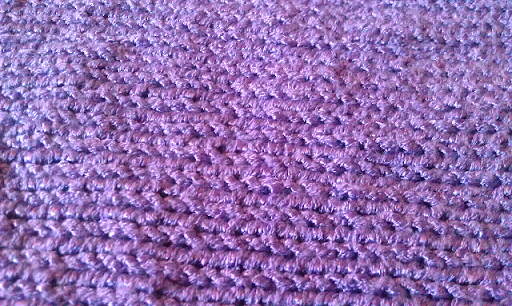 I have no idea what the yarn is, but it is a little shiny and there is definitely some elastic in it (which is why I can still get it on.) I remember my first attempt at blocking, but this sweater did not hold shape well. This is the reason why I ended up not leaving the buttons on it, the edges curled and if I tried to close it it looked awful. I believe I knit this on size 13 or 15 knitting needles. 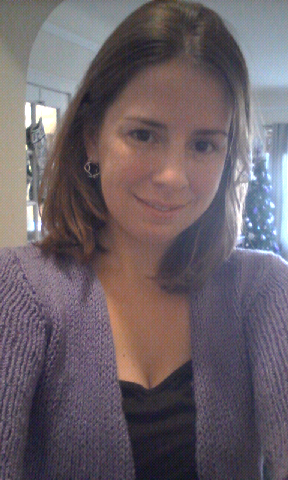 The sweater no longer fits me as I would like (styles, and my weight, have changed in the last 10 years!) But I will hang onto this for my potential future daughter. What I learned is that my daughter wouldn't wear anything I wore ... and says she doesn't like clutter or doodads or old furniture. My suggestion is to use your first sweater on a nice doll and see it for as long as it pleases you. My daughter was 50 last June. It would be offered to a daughter for a doll/teddy bear as much as herself. :) I never expect someone to wear something I made, I always hope that if they do not like it that they would give it (donate it) away. Just discovered your blog while searching for tips on knitwear designs. Nice to know I'm not the only biochemist who's obsessed with knitting! A few years behind you - starting doctoral program in the fall. If you don't mind me asking, what was is your primary focus? I studied mechanistic enzymology. Many people in my lab knitted, so we often talked about fiber projects in addition to our scientific ones. I love finding other knitting scientists!